This article is about the computer game. For the source of the phrase "the meek shall inherit the earth", see Matthew 5:5. For the 2002 film, see Inherit the Earth (film). 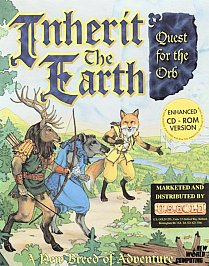 Inherit the Earth: Quest for the Orb is an adventure game developed by The Dreamers Guild and published by New World Computing in 1994. The point and click adventure game features a world full of talking, humanoid animals, amongst them a fox on his quest to find a stolen orb, a relic of the mythical humans. Inherit the Earth was developed by The Dreamers Guild for the DOS platform and published by New World Computing. The game was originally released in 1994 and later ported to the Macintosh. The German version Erben der Erde: Die große Suche was published by Softgold and first released as a port to the Amiga, followed by the DOS version. In 1996 the German Computer magazine with CD "Bestseller Games #10" brought 300,000 units of ITE on the German market as budget release. In 2000 the former Dreamers Guild co-founder Joe Pearce started a new company Wyrmkeep Entertainment. In 2002 Pearce was able to acquire the rights for the game, and self-published Inherit the Earth on his website for Windows and macOS. The full version was offered for $20 via PayPal and Kagi.com, while a free demo was downloadable. In late 2004 Pearce provided the ScummVM developers with the source code of ITE's SAGA engine (Scripts for Animated Graphic Adventures), which made ports to alternative platforms, like Linux, possible. In March 2007, a Pocket PC edition was released. This was followed by a port to the iPad in 2010. The game has also seen a digital release on GOG.com and Steam in June 2013. According to one of the original artists and animators, Lisa Jennings, the game was originally intended to be part of a trilogy, but due to conflicts between the developer and publisher, this never happened. This is why the game ends on a "To be continued" like note. On January 13, 2013 a Kickstarter crowdfunding campaign for the development of a sequel was initiated by Wyrmkeep Entertainment, but the funding goal was not met. A second campaign was started on July 16, 2014 with a higher goal to account for adding voice acting to the project. This campaign was also unsuccessful. On March 5, 2015, a Patreon funding drive was launched, with the aim to help finish funding the sequel's first of three chapters. This Patreon should lead into another Kickstarter drive, with the base goal undetermined, but stated to be under $30,000. In a far future, mankind is extinct and Earth is populated by several tribes of anthropomorphic animals – collectively referred to as the Morph – who have achieved a level of technology and societal sophistication roughly equivalent to European civilization in the High Middle Ages. The humans are enshrined in legends as having been the ones who gave the Morph prehensile hands, mouths capable of speech, and the ability to think and feel, but the Morph have very little understanding of their long-lost forebears, who exist now only in stories, ruins and a few technological relics. The game begins with the protagonist, Rif of the Fox Tribe, being falsely accused of having stolen the Orb of Storms (a technological relic of humankind which is able to predict the weather), primarily based on the fact that he was one of only two foxes in the area at the time of the theft. Rif volunteers to look for the Orb himself, and is given aid (and guards) in the form of Eeah of the Elk Guard and Okk of the Boar Tribe. As added insurance, the Boar King takes Rif's girlfriend Rhene hostage. The trio circulate throughout the Known Lands over the course of their investigation; along the way, they discover the idiosyncrasies and strengths of the various Tribes under the protection of the Forest King (the Elk Tribe ruler who exerts hegemonic control over the whole region), some of which have other Orbs containing other knowledge left behind by the humans. With the assistance of Sist, the leader of the Rats, they eventually discover that the Orb of Storms was stolen by a Raccoon, an animal rarely, if ever, seen in the Known Lands. More worryingly, Sist reveals that the Boar King has formed an alliance with the Wolves who live far to the north; the two incidents are probably related. Riff, Okk, and Eeah attempt to pass into the Wild Lands, the untamed regions to the north, but are apprehended by Prince, the selfish, spoiled ruler of the castle that the Dogs have sequestered themselves in. Rif manages to escape, and eventually enlists the aid of Alama, a Cat hermit, and a whole tribe of wildcats in freeing his friends. The trio then secure passage further north, to the isolated island the Wolves have claimed for themselves. Once there, they learn that the Raccoon, Chota, has manipulated the Wolves' politics and stolen the Orb to take over the Known Lands, as the Orb of Storms is apparently the key to some sort of system left behind by the humans to control the weather. Deep inside Chota's fortress, a human hydroelectric dam, Rif, Okk and Eeah are able to outwit their enemies, and Chota and the Orb are presumed lost. The trio return to the Known Lands, where Rif makes an impassioned plea for the Tribes to work together, and that by combining their strengths, they won't need the Orbs to make their lives better. The Forest King take his advice, promotes Okk and Eeah, and releases Rhene. Unknown to all, however, the Orb of Storms was not destroyed, and is preparing to initiate Chota's final command to begin a long drought. It awaits input on the ending date of the drought. A background theme of the game is the fate of the humans. The game's introduction and manual explain that the humans created the Morph from their constituent animals, and then mysteriously disappeared sometime later. Nearly all information about humans, their civilization and their technology has been lost or passed into legend. The Rats, the most educated tribe, are the only ones who wholeheartedly believe in the humans' existence, due to their carefully documented exploration of human ruins; their ancestors were small enough to be kept in cages while they received "The Gift" (presumably the genetic modifications that turned them into the Morph). Most of the human relics are in the third area of the game. On the North Island, the player explores ancient human ruins of hydroelectric dams, airports, and solar observatories. Clues, such as a flashing "EVACUATE" sign in the lobby of the building near the airport, and the fact that much of the equipment in the solar observatory and dam was left, imply that a sudden disaster may have overtaken the humans. David Joiner, one of the game's key developers, revealed in an interview that humanity was eradicated by an airborne biological weapon, a scenario that was inspired by the Alistair MacLean novel The Satan Bug. This is alluded to in the game's opening sequence, which shows a tapestry depicting humans fleeing what looks like a giant microbe. The developers also explored the idea of humans living in a lunar base, alluded to in-game, when an astronomer/cartographer named Tycho Northpaw claims that the humans literally carved the features of the "Man on the Moon" to remind the morphs that they are being watched. Inside a hangar in the airport, there is a vehicle that appears to be an incomplete spacecraft. Players[weasel words] have commented that some sections of the game feel contrived, particularly the opening scene, which establishes all major elements of the story within a few minutes with no player decisions. This, combined with the lack of development of the Rhene character, has been attributed[weasel words] to the difficulties associated with combining a serious and detailed plot with anthropomorphic animals - a theme usually associated with children's entertainment. The abrupt opening suggests part of the script may have been removed. Our biggest conflict was simple: the developers wanted something that was rather adult in nature. The publishers saw animals and equated it with children, and so forced us at every turn to cater to the 8-12 range, up to and including removing any death scenes to keep a Children's Rating. The story of the video game is continued in the official webcomic, Inherit the Earth, which takes place ten months after the events of the game. The webcomic is drawn by Allison Hershey, the game's original art designer, and co-written by Joe Pearce, the owner of Wyrmkeep Entertainment. Computer Gaming World in August 1994 rated Inherit the Earth 2.5 stars out of five. While praising the graphics' "storybook charm" the reviewer stated that the game had too many mazes and fetch quests "tacked in order to extend its limited game play". He reported an "abrupt", incomplete ending and concluded that the game's "puzzles were given the least amount of attention". The game was reviewed in 1994 in Dragon #209 by Sandy Petersen in the "Eye of the Monitor" column. Petersen gave the game 2 out of 5 stars. Amiga Games issue 9/95 gave 92% and ASM issue 10/94 gave 10/12 points. While not a commercial success, the game has some loyal following in the furry fandom. ^ Dickens, Evan (October 1, 2003). "Joe Pearce Interview". Adventure Gamers. Retrieved July 14, 2018. ^ Marceau, Erica (September 2, 2004). "Inherit the Earth". Archived from the original on June 6, 2008. ^ "Purchase Inherit the Earth". 2002. Archived from the original on August 11, 2003. Retrieved July 17, 2018. ^ Moss, Richard (January 16, 2012). "How scummvm kept adventure gaming alive". Ars Technica. Retrieved July 17, 2018. ^ "Wyrmkeep Entertainment is creating Inherit the earth: sand and shadows". Patreon Page. ^ Greenberg, Allen L. (August 1994). "Aesop's Quest". Computer Gaming World. pp. 42, 44. ^ Petersen, Sandy (September 1994). "Eye of the Monitor". Dragon (209): 61–62.